So long Lou Reed (1942-2013), coolest musician of the 1960s by a long shot (well along with the rest of the Velvet Underground anyway). 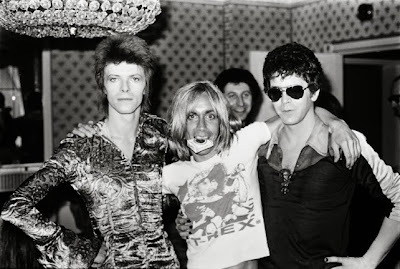 Everyone knows that John Cale from the band went to Goldsmiths in New Cross, but Lou was always more New York. But of course there was a transpontine connection. In July 1972, with encouragement from David Bowie, Reed came to London to do his first UK show at the Kings Cross Cinema. The next night, Iggy Pop played his first ever gig outside of the USA at the same venue. According to Paul Trynka in his book 'Iggy Pop: Open up and bleed' (2009), Iggy and band - which included ex-Stooges Ron and Scott Asheton with guitarist James Williamson - prepared from late June 'rehearsing feverishly at Underhill Studios in Greenwich... Lou Reed was rehearsing his own band the Tots, in the studio the same month, while the Spiders From Mars were also preparing for their July shows. London band England's Glory were rehearsing in the adjacent studio'. The latter featured Peter Perrett, later of The Only Ones. Bowie was living in Beckenham at the time, Tynka discusses his Underhill studio rehearsals in his book 'Starman'. In an interview in the South London Press, Tynka identified the location of the studio as in the basemen of what is now Gee-Pharm chemists on the corner of Blackheath Hill and Greenwich South Street. Later in 1972, Lou Reed rented a flat in Wimbledon where he lived while recording the Transformer album.